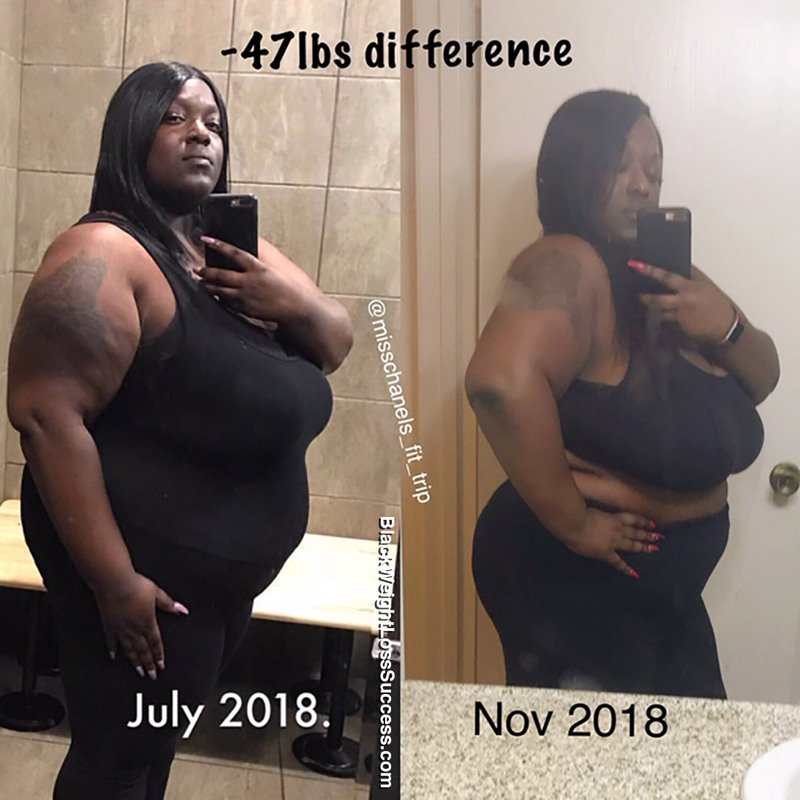 Transformation of the Day: Chanel lost 52 pounds. PCOS and high blood pressure couldn’t stop her. After years of trying to release the weight, she found that a Keto/Low Carb diet works best for her. She learned how to change her mindset and let go of unhealthy habits. 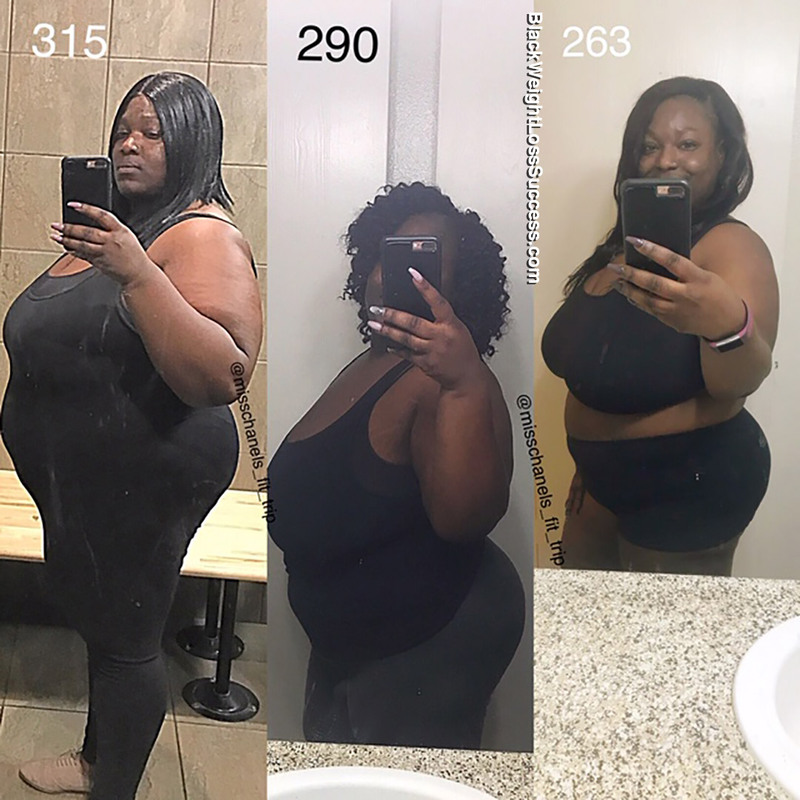 Back in April 2018, I weighed in at my highest weight ever of 315 pounds at 5’3″. I began to go to the gym 5 times a week and drink a gallon of water each day. I also watched what I ate and restricted my calorie intake. Even after doing all of that, no results were being produced. I was hopeless and severely depressed. I was also dealing with severe high blood pressure and Polycystic ovary syndrome (PCOS – a hormonal imbalance that contributed significantly to my weight gain). Despite all this, I knew that if I just kept going changes would come at some point, so I never gave up. In July, I decided to try a Keto/Low Carb diet. From there, I started slowly to lose pounds. Midway through July, I incorporated intermittent fasting, and from there the weight and inches began to shed. Within 2 1/2 months, I dropped 40 pounds and 25 inches from all over my body. My current weight is 263 pounds. What inspired you to keep going? I have tried to lose weight for many years. I’ve acquired enough knowledge to know that our thought-life influences the way we act and feel. I accepted full responsibility for my choices and stopped making excuses for not taking my health seriously. I pushed through every negative thought I had. I told myself that if I keep pushing forward, a change was bound to happen. I changed my mindset and started breaking years of bad habits. That’s when the weight loss began to happen. I took control of my life and my choices. I walked for at least 30 mins a day and did at-home dance workout videos. I worked out 3-5 times a week, but the Keto diet has been the most significant factor in my journey when it comes to getting results. We can do anything that we put our mind to. We are stronger than we think we are. What advice would you like to share with women who want to lose weight? Don’t give up, no matter how hard or long it takes. Every day is another day to grow closer to your goal. Keep up the good work. I am starting my weight loss journey in the new year. Can’t wait to post my updates on this site.